It's not that I'm surprised Goon was funny. Coming from the writing team of Jay Baruchel and Evan Goldberg (log-time stalwarts of the Judd Apatow repertory company), the laughs were a given. What I wasn't expecting was the heart. In other words, I'm not surprised it was good in the sense that it'd be fun to watch with a bunch of like-minded, desensitized friends. But I can't believe it was good in the sense that I'd recommend it to more thoughtful people. That's not to say that Goon isn't profane. It is, and gloriously so. Baruchel's character's dialogue would be 65% bleeped if this film ever made it to network television (which it won't). Seann William Scott stars as a pleasantly dimwitted Canadian bouncer who, while attending a local game, beats up a minor league hockey player who climbs into the stands. A coach is impressed, and offers him a contract. Scott finds himself in a whole new world, when he never understood his first one all that well. What he knows is how to be loyal, and he gives a winning performance. Liev Schreiber also plays well as a grizzled, broken-down version of the player Scott has set out to be. 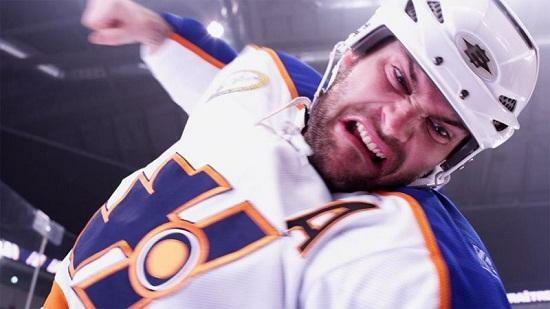 Hockey films are ripe soil for drama, being ordinarily set in more blue-collar worlds than other sports films. Minor league hockey is perhaps most ripe of all. There are no million dollar contracts and no groupies (well, there's one, played by Alison Pill, who's dealing with her own issues), just tattered jerseys, rusting buses, and frozen sidewalks. Everyone's scraping to get by, and this allows humor and gravitas to exist in equal parts. Goon will embarrass you if you try to show it to your mom, but only because of the naughty language. It's a film where the big game victory only ensures the hero of a playoff spot, a much more true-to-life reward than the usual lovable-losers-become-champions plotline. The goals might be modest, but they're carried off with a lot of feeling.